Nutritional plant-based supplement targeting the cellular level of the brain naturally to enhance cognitive function and memory. NuMedica Phosphatidyl Serine is a soy-free formula that can help you maintain or improve your cognitive function with its nutritional composition that targets the cellular level of your brain's function. Many natural foods have been shown to enhance brain function. Now, you can take one convenient nutritional supplement to improve everyday cognitive functions like concentration and memory. 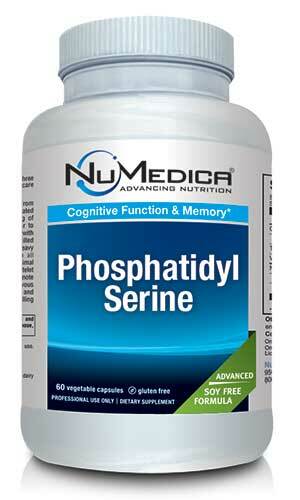 Phosphatidyl serine is a natural chemical that is made in the body. However, most of this chemical is received through our diet. This chemical is needed by various parts of the body including the brain. It is needed to maintain cellular function, particularly in the brain. Many people, young adults and the elderly alike, have found that a phosphatidyl serine supplement improves their thinking abilities, reduces depression, and enhances memory. Some researchers suggest it can improve symptoms of ADHD and even prevent stress related to exercise or athletic activity. This chemical may also enhance other aspects of brain function. Initial studies have demonstrated that plant-based phosphatidyl serine supplements can help improve cognitive function and enhance memory. In fact, cow-derived plant-based phosphatidyl serine supplements showed some improvement in people with mild memory-loss symptoms associated with Alzheimer's disease. The fear of mad cow disease, however, has encouraged scientists to look more closely at plant base based phosphatidyl serine, which is often derived from plants like soy and cabbage. NuMedica Phosphatidyl Serine is plant-derived but does not contain soy. Directions: Take one capsule up to three times daily or as directed by your healthcare practitioner. MCC (microcrystalline cellulose), HPMC (vegetable capsule), rice flour, silica, ascorbyl palmitate. Highly absorbable, ethanol-free formula providing 7,800 mg of phospholipids from certified non-GMO sunflower oil.